Sustainability and social responsibility are anchored in our corporate strategy and are consistently put into practice on a daily basis. As a leading brand for premium bag solutions, we are consciously aware of our social and ecological responsibility and actively shape the future. We are committed to finding innovative ways to conserve resources and build on fair partnerships with customers, suppliers and employees. Offering apprenticeships and training positions in our worldwide offices we accompany young talents while at the same time valuing the know-how and high service level of many long-time staff members. As a member of amfori, DICOTA is deeply dedicated to improving working conditions in global supply chains. Amfori eleven-point charter not only covers comprehensive worker protection but also health and safety provisions and workplace equality. Protection against child labour is also part of the Code of Conduct providing appropriate training measures for young people. Working closely together with our suppliers we ensure that the extensive criteria for the certification are continuously implemented. Our partners undertake to fully comply with the Code of Conduct and stand up for fair and social working conditions on-site. Environmental protection is another key principle of the amfori initiative and at DICOTA sustainability is put into action on a daily basis. We lay the foundations for sustainable and environmentally friendly solutions starting at the drawing table. Consistent recycling helps to conserve resources. DICOTA focuses on sustainable alternatives when selecting materials. The main material for our SCALE collection as well as for the SELECT collection is made out of 100% mechanically recycled PET. This material reduces burdens on the environment without compromising on quality, look and feel. Instead of being burned, used drinking bottles are collected, sorted by colour and washed. After this the bottles are crushed and the thereof resulting PET-flakes are heated and pressed into dense pellets. This raw material is then processed into polyester fibre and spun into yarn. Thereof results high quality fabric as ecologically sound basis for durable DICOTA bags. Recycling bottles and turning them into fibres comes with multiple advantages: preserving resources and minimizing waste. The purposeful reuse prevents plastics from ending up in landfills and oceans – where they take about 450 years to biodegrade. Studies show that recycling polyester uses above 50% less energy and cut down CO2 emissions by about to the same extent compared to virgin polyester. 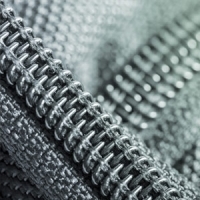 In order to ensure responsible social and environmental practices and chemical usage throughout the entire production, DICOTA requires all its suppliers for recycled PET yarns to comply with the Global Recycled Standard. Currently over 20% of the full DICOTA range is made of recycled material and each product gives a new live to 6-16 PET bottles. In the past 5 years DICOTA has produced over 335,000 carrying solutions out of recycled PET. Over the last 5 years, DICOTA has been producing over 335,000 carrying solutions out of recycled PET. While doing so we’ve been able to give a new live to over 2.5 million PET bottles (0.5l). If you were to put all of those bottles end by end, you could cover the distance from Berlin to Amsterdam. By 2022 we target replacing the main material for all our textile products by recycled materials. Today environmentally conscious users not only think about recycling possibilities but as well try to reduce waste and reuse products whenever they can. Durable material, tear-resistant threads in the seams, high-quality zips and sturdy metal parts on the load points are the foundations upon which long-lasting solutions are built. At DICOTA we ensure highest durability of our products by using qualitatively first-class components and careful workmanship. We underscore this by providing a lifetime* guarantee on our notebook bags. *Due to legal restrictions in Germany, only for a period of 30 years. No time restrictions in other countries. Our checks mean we can be sure of delivering quality products and promise you the same certainty. We continually verify that the products adhere to strict quality requirements right from the moment they’re produced to when they are sold. Our products are thus comprehensively tested by us as well as by independent institutes in order to ensure that the materials are up to the challenge of everyday wear and tear, correspond to the applicable legal provisions and are free from hazardous substances. Not only do we care about using recycled material as the basis for our products, we furthermore attach great importance to minimising waste and optimizing material flows when designing our products and packaging solutions. We consider volume and weight while striving to keep our transportation routes as short and as energy efficient as possible. Adhesives, textile coatings, but also plastic parts and packaging often contain substances which are dangerous for humans and the environment. REACH, the European regulation for registration, evaluation, authorisation and restriction of chemicals, defines the practice when handling such substances. As part of the SVHC list (Substances of Very High Concern), the materials processed by DICOTA are inspected for harmful or even health-damaging elements (e.g. PVC). All products belonging to the DICOTA brand have met the constantly increasing requirements since 2011. Compliance is ensured through ongoing, independent laboratory analyses and strict on-site control of by our Hong Kong Team. Further information on the European regulation can be found here. Participating in the initiative of The Green Dot, DICOTA plays an active role in the resource-saving handling of packaging material. We meet our responsibility and contribute towards financing the recycling process, allowing our customers to consciously dispose of the product packaging free of charge. Used packaging is recycled and the thereof gained raw materials are returned to the economic cycle gaining energy while minimizing greenhouse gas emissions. 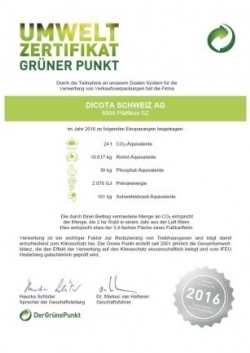 Our Environment-Certificate impressively shows which savings have been contributed by DICOTA in the previous year through consistent recycling. For Germany, the savings that we have been able to accomplish in Germany in 2017 are equivalent to what is needed to wash clothes in 943 households for a one-year period. For our marketing materials and office supplies, we use FSC-certified paper wherever possible, for example, for catalogues, printing paper and envelopes. Through the targeted promotion of responsible forest management, FSC is committed to reducing environmental pollution, protecting human rights and avoiding uncontrolled deforestation. The above-mentioned efforts demonstrate that we have achieved a lot already and take responsibility for the social and ecological environment in all divisions of the company. DICOTA even goes one step further by supporting the globally active non-profit Labdoo aid project. Millions of unused and already discarded but still functioning computers are gathering dust in many European households. Labdoo has set itself the task of unearthing this treasure and to bring these computers in circulation again for meaningful and environmentally friendly reuse. The organization collects used notebooks, prepares them professionally and provides the devices to schools, homes, educational institutions or integration projects in developing countries. DICOTA has been supporting the project over many years in with donations in kind in the form of carrying solutions. Since the beginning of this year, the DICOTA premises in Germany and Switzerland now also function as acceptance and collection points for used notebooks. DICOTA then forwards the devices to Labdoo and also donates an additional 25 Euros per notebook to the aid organization. The Labdoo philosophy perfectly dovetails with our sustainability strategy, which we pursue with a great sense of purpose and commitment. Learn more on www.labdoo.org.